Pierre Pan is a fashionista and has his own range of beauty products. He has a turbulent relationship with his one remaining crew member: Toto. Eagle G. and Mr Smith, the supply teacher, are transported by the magical Telly Fairies to meet their hero. During their adventure with Pierre Pan they are attacked by Crocy the Crocodile. Will anyone get eaten? Will they ever return to the real world again? But me gran tells me to change my pants. Aye! PIERRE PAN: Ooh la la, you not listening to the order. But, we forgive you. 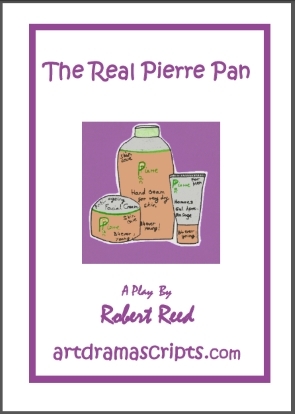 "The Real Pierre Pan is an excellent parody of characters from traditional British pantomime (Peter Pan) and modern American culture (rap stars). How does one stay young forever? The character of Pierre Pan is obsessed with fashion and beauty and sleeps through the adventure part of the play. What's more, he is not brave at all. In real life, Granny is in charge. Eagle G, like in reality, a wanna be rap star, likes food and telly, reports to Granny, and plays cool (he is a positive character; it's an educational play for kids - he is as a role model here). All is possible in the magical Tellyworld. The heroes of the show are the Marines - the comedy of situation is nailed by their brief but grand entrance and appearance. It is not military at all - they appear just as a bunch of cadets on their training. For a maximum effect, get the real ones if you can! It is apparent that Mr Smith's character was incorporated into the play to entice the attention paying teachers with a couple of references to their 'teaching life'. The kids might enjoy having a laugh at a poor supply teacher's misfortunes. The brave ones could have a teacher playing the part. The play is primarily a comedy aiming to entertain the family audience, and possibly raise an interest in French as a foreign language - but the social comments are notable by spectators of all ages." "The Real Pierre Pan is an excellent parody of characters from traditional British pantomime (Peter Pan) and modern American culture (rap stars)..."